6 months ago, we poised ourselves with a challenge. As wheel lovers at heart, we found ourselves reminiscing over a nearly two-decade-old HRE catalogue, wondering what it would take to bring back the "glory" days. Could the classics be revived, pulled from the grave and given new life? If so, what would it take? Most importantly, did STANCE|WORKS have the power to pull it all off; could we make it happen? Well, as the pictures might show, we most certainly did. In August of last year, we approached HRE with a proposal to bring the wheels from the '80s and '90s back to life, updated to suit the cars of today with a bit of vintage flair. Our love for HRE's older wheels and our desire to see something similar in today's marketplace meant we walked through HRE's doors with guns'a'blazin'. Armed with renderings and a pitch, we argued that the industry needed someone to step up to the plate. Few companies can make claims of heritage these days, and even fewer have the ability to revive it. 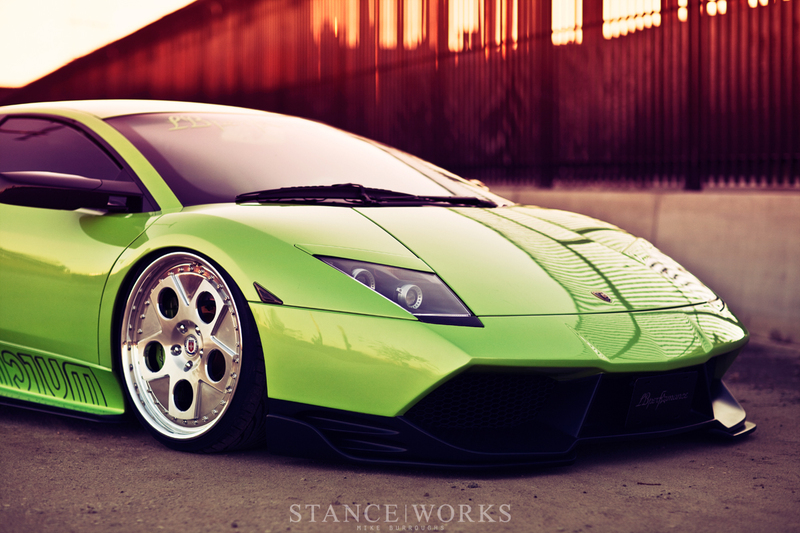 Our initial render featured a lime-green Lamborghini sitting on the HRE 454, one we had been eyeing for quite some time. 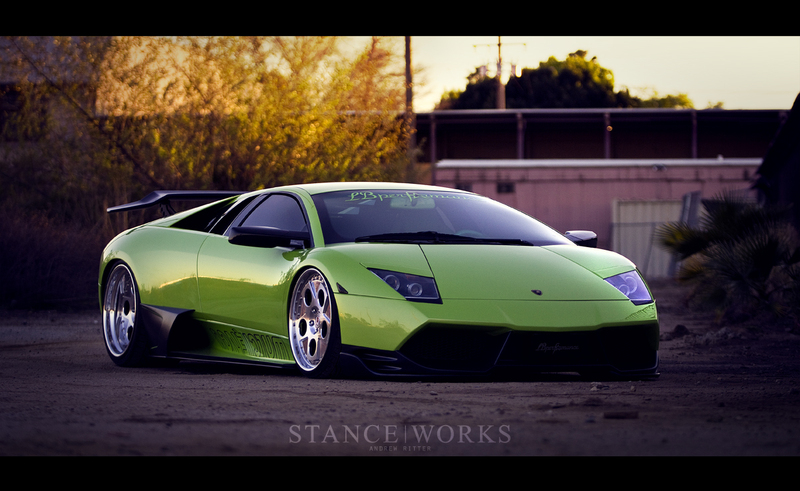 The car we fancied for the official unveiling was LB Performance's bagged and kitted Murcielago... But in order to make it happen, strings had to be pulled. As if getting access to a modified Lamborghini wasn't hard enough, the one we wanted needed to be shipped to California... From Japan. Of course our friends at MasterMind pulled it off, and it wasn't long before we found ourselves staring at the Liberty Walk V12-powered exotic. 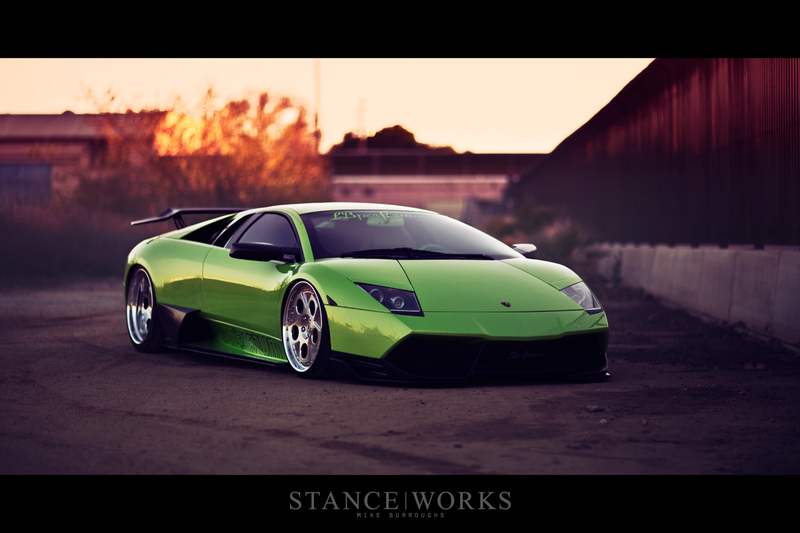 Even after 6 months of planning, it's hard to answer the question "Where do we shoot a bright green bagged Lambo?" With each week a new location idea would arise, but as expected on the west coast, securing a location is never an easy thing. With quotes ranging from $6000/day to $1500/hour just to photograph the car, it seemed like getting the perfect location was becoming impossible. After all, a parking lot wasn't going to cut it. Once the car arrived from Japan and the wheels had been fitted, the clock began ticking, and it was time to buckle down and find the right place. It wasn't until D-Day that we stumbled upon the perfect spot: an abandoned lot in the heart of LA, slowly breaking apart as the desert vegetation punched through the asphalt. The lot was wrapped in chain link fencing, untouched by anyone except the wildlife that had taken refuge in the shrubbery. The gold and purple tones of the setting sun lent to the screaming green of the enamel paint, and layer of dust and debris covered the sun-baked tarmac. Simply finding a place to rest the belly of the beast proved a challenge. As the sun neared the horizon we found ourselves capturing the images we had been anticipating for months. None of us are supercar guys at heart; I know I'm not alone when I'd say I prefer more historic metal, usually with a bit more reserve to it... 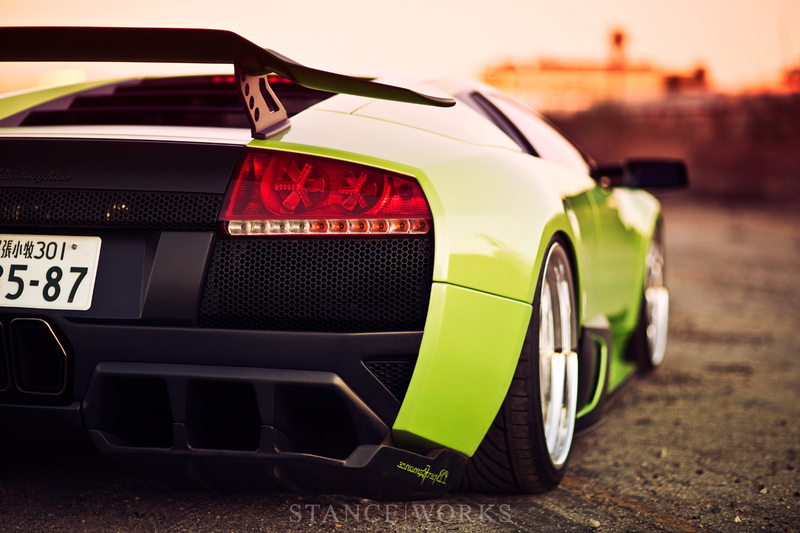 But every guy's inner child is excited by a flashy lamborghini when you get up close and personal with it. It's been an exciting climax to a long project, with many of us gathering as both co-workers and friends around the Italian bull. After all, changing the industry is worth celebrating. It's a big step from casual blogging. awesome photos and great article – goes to show how timeless these wheels are! Meh. Bet he wish he would of waited so he could of bought an Aventador. So much more super of a car.